Wartburg, TN (2018-09-19) A Morgan County Grand Jury has returned indictments against an inmate and seven others at the Morgan County Correctional Complex for allegedly introducing contraband into the prison. On Tuesday, a Grand Jury indicted Robert Fusco and several co-defendants in connection with a lengthy investigation by the Tennessee Department of Correction and the Tennessee Bureau of Investigation into an alleged attempt by Fusco to introduce contraband into the Morgan County Correctional Complex. During the investigation, authorities reportedly collected evidence that Fusco, who was a minimum-security inmate at the prison, breached the secure perimeter of the facility. Authorities say it was a highly unusual case because Fusco wasn’t trying to escape but was trying to introduce contraband into the facility. Fusco was indicted on charges of escape (felony), conspiracy to escape (felony), and for having an unlawful telecommunications device in a penal facility. 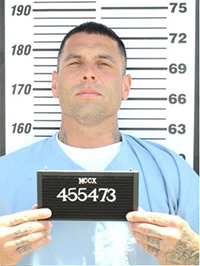 Immediately following the incident inmate Fusco was classified as a maximum custody inmate and reassigned to West Tennessee State Penitentiary. “This investigation and subsequent indictments should serve as a reminder that the department will not tolerate any threat to the safety and security of our facilities,” Commissioner Tony Parker said. “We have been, and will continue to be, relentless in the prosecution of those that violate their oath and violate the law. Any person threatening this department’s mission will be held accountable be it staff, inmate or community member,” he added.